In an earlier post titled “How We Broke The Boat,” I described how I managed to part our topping lift while cruising in the Bahamas a few months ago. At the time, a temporary repair was the best we could manage. Now that we’re back home for the summer, getting this properly repaired was high on our to-do list. After ordering the parts from Rig-Rite, we scheduled a date with our rigger. We only have two lines that go to the top of the mast. 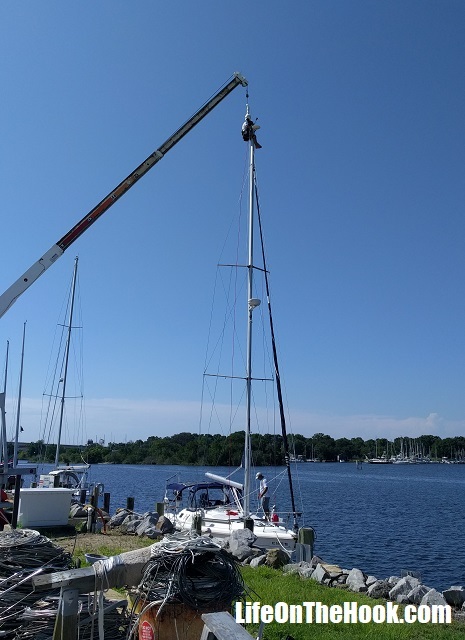 One, the topping lift, was broken, and the other, the main halyard, needed some adjustment as part of the repair. 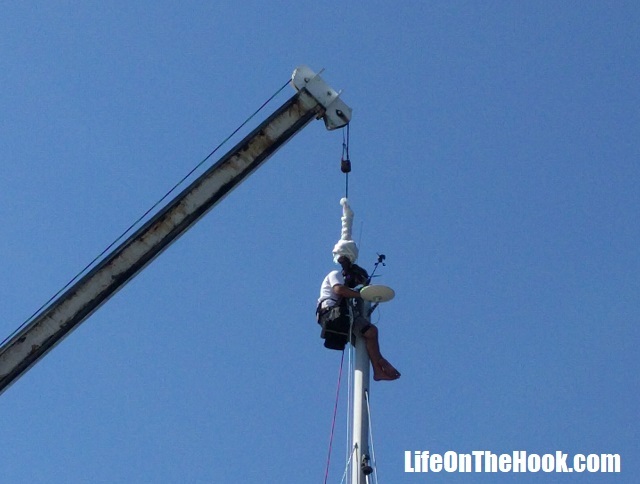 That meant there was no line available to haul someone to the top of the mast, so we had to take the boat to the shipyard in order to use their boom truck to hoist someone up. When ordering new axles and sheaves for the top of the mast, I’d ordered a few extra, “just in case.” It turned out to be a good thing, because once our rigger got to work, he determined that we were dealing with a much bigger mess than we thought. Not only was the sheave (small pulley) and axle for the topping lift destroyed, but the ones for the main halyard as well. Basically all the little pulleys and the axles they rode on at the mast top were trash. Suddenly it all became clear. I thought I’d broken the topping lift by over-tightening the mainsheet and pulling the boom down too far. But our problems probably started a year earlier when we’d had trouble with our mainsail head swivel. For some reason (I can’t really remember), we had taken the mainsail down. Perhaps it was in order to ship it off to SailCare for cleaning. When it came time to re-install the sail, it refused to go on. The top swivel, which attaches to the head of the sail, wouldn’t go up the track inside the mast. It would hang up about a quarter of the way, and then refuse to go another inch. 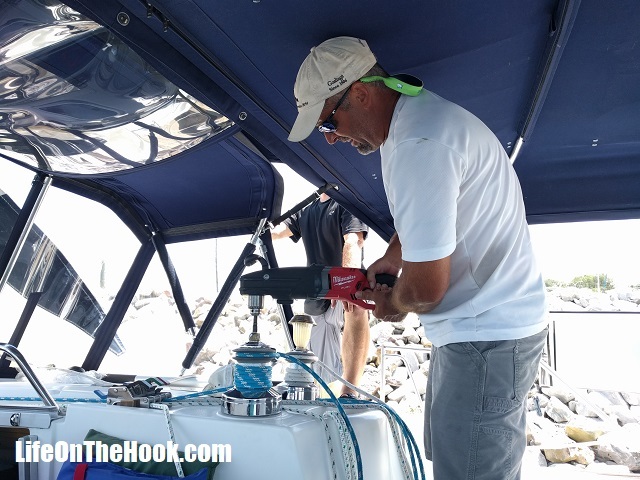 We continued applying more and more force with the winch, until the halyard was as tight as a guitar string, but the swivel just wouldn’t budge. Eventually I gave up and called the riggers, who diagnosed and fixed the problem (a loose screw on the swivel that had backed out enough for the screw head to catch on something inside the mast). But unknowingly, when we were trying to force the swivel to go up the mast, we applied so much force to the halyard that we crushed the sheaves and axles at the mast head. No wonder I’d almost had a heart attack down in New Providence while trying to winch someone up the mast to do our temporary topping lift repair! I had 160 pounds of French Canadian hanging from a line that I thought was running freely over a pulley at the top of the mast. But it was actually just dragging over a crushed pile of pulley and axle parts that were no longer capable of doing their job. I feel much better now about having needed five rest breaks to get him all the way to the top! In any event, all is now squared away at the top of Eagle Too’s mast. The efficient folks at Zern Rigging finished the job in a little over two hours, and then we were back out on Pensacola Bay, where we rolled out the sails and tested everything out. We’re good as new and ready to go! This entry was posted in How? 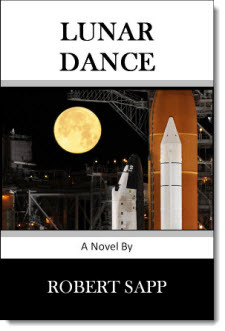 and tagged Fixing broken topping lift, Mast maintenance, Rigging repairs on July 19, 2018 by Robert.